Shahram Akbarzadeh caught up with Associate Professor Julian Millie of Monash University for the AAIMS Quarterly. Associate Professor Julian Millie is ARC Future Fellow in the Anthropology program of the Monash Faculty of Arts, and has been studying and researching Indonesian Islam for more than two decades now. His particular focus is on embodied practice, and its social and political meanings. Julian’s major publications include: Splashed by the Saint: Ritual Reading and Islamic sanctity in West Java (KITLV, 2009), and Hearing Allah’s Call: Preaching and Performance in Indonesian Islam (Cornell University Press, 2017) (https://sagehouse.blog/tag/julian-millie/). Shahram: Julian, tell us about your current project? Julian: All my work over the last decade and a half has been focussed on practice, that is of the embodied kind (‘ibadah), and the social and political meanings of this. Flowing on from that, in this Future Fellowship I have been working with two things that are almost always separated in analysis: embodied practice, and what I call Muslims’ mediated awareness of belonging to communities of various kinds, but especially their awareness of being a citizen of Indonesia. Shahram: Why is this so important? Julian: Because practice is clearly so critical to understanding everyday life and politics in Muslim-majority populations, but it is not easy to be specific about its critical meanings in analysis. Based on my previous experiences, all of which have involved actually participating in observances, I have had many chances to think about those critical meanings. My first project in West Java was about an intercession ritual. I spent fourteen months attending a ritual in which people pray for help via the great saint Abdul Qadir al-Jaelani, who is very popular in Indonesia. After that, I spent almost a decade researching Islamic oratory and its conventions in West Java. So I have had plenty of opportunity to observe the significance of practice in everyday Muslim life in Indonesia. Yet when we listen to the people who speak most authoritatively about Islam in Indonesia, and I am referring to Muslim leaders here, most of them very rarely mention practice. In fact, in conversations about Islam and public life, we might even get the impression that bodily practice was a thing of the past. This research is recognising that practice is central to social and political life in contemporary Indonesia. Shahram: Can you give us an example? Julian: A good example is the recent shariah regulations that local governments have been passing in Indonesia. These have caused lots of debate, for the regulations frequently make life harder for women and minorities. There is no doubt about that. At the same time, I have noticed that they do express something important that is connected to practice. In communities where collective practice is held to be very important, people seem to have a distinct notion about public life and its orderliness. This notion can be understood as politeness or etiquette. Now, the regulations are full of these words, and rules about polite behaviour. For western analysts, these are easy to look over. I mean…in the western repertoire of public concepts, etiquette and politeness do not count. But in areas like rural West Java, for example, understanding how practice engenders a specific normative idea about an orderly public environment helps us, I think, to get a better picture of why those regulations attract so much public support. Shahram: How important is your knowledge of a sub-national language, I mean Sundanese, to this research? Julian: Absolutely, there is a huge connection. If we look at routines of embodied practice, they are things that structure everyday life. They are experiences that people carry out with their own words and hands, often in an unreflective way. These routines can make it appear as if there were a great distance between everyday practice and the subjectivity we associate with national citizenship. When I was doing my PhD at Leiden University, I started learning Sundanese. Now, people here in Australia do not know how big some of Indonesia’s ethnic groups are! There are about 35,000,000, Sundanese, all of them living just on the other side of Australia’s northern border. Once you have some handle on people’s everyday language, it is transformative for the ways you can share in their experience of life. You can share experiences and interpret meanings that occur on a far more intimate level. So yes, for studying practice, knowing sub-national languages is critical. It just opens things up. Shahram: What kinds of collaboration do you use in this research, Julian? Julian: I have been working for quite a while with researchers from one of the universities under the Indonesian Ministry of Religious Affairs, UIN Sunan Gunung Djati, in Bandung. I learnt so much from them. Some of them work in the Dakwah faculty, and this has been valuable for me, because the idea of a dakwah faculty in a state university is a little unusual outside the Indonesian context, but this is a fascinating area of state action, and the people there are very switched-on and willing to collaborate, so it has been mutually beneficial, I think. Also, they know how to eat, and most days includes a practical lesson in Sundanese culinary tradition! Shahram: Thanks Julian, and all the best for your research. Julian: Thanks Shahram for your time. 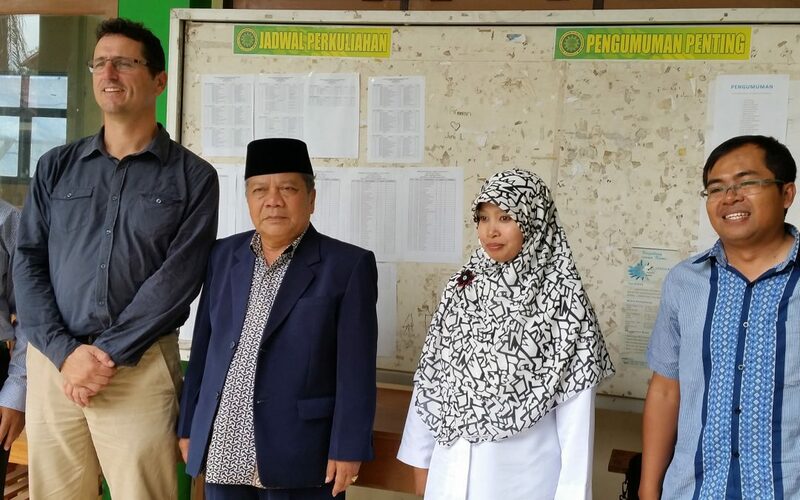 Image: Julian on a visit to the Islamic school run by Ustad Aceng Zakaria (standing on Julian’s left) in Ranca Bango, Garut.